hi monkeys! i am in the very final hours of a week off work. i am thinking about things such as alarm clocks and clean clothes and where is my MetroPass. i also just watched “The Grandfather,” so I’m thinking about our Gossip Girl characters but when am i not. i am always thinking about them. or britney. or you. yes yes yes. Could there be anything better than that? sigh. no. on the new episode of Gossip Girl, Carter Baizen (Sebastian Stan) is once again gracing us with his presence — we last saw him touching the knee of a down-on-her-luck Blair Cornelia Waldorf. as we know, those two are a real-life couple and i kinda love how many couples there are on the Gossip Girl set. I mean, why not? But is Chace Crawford the only single one? and Taylor Momsen but she is a youngun. anyways, i watched the two hour premiere of Kings this past week, and let me tell you (a) i liked it, (b) will it go in the spot where Battlestar once was? (i don’t mean in terms of being a Top Five Show of All Time show but in filling the now vacant “alternate universe deals with important questions and is sorta manly” department of my viewing habits), and (c) Sebastian Stan, who plays the son to the King, was jaw-droppingly good in it. He’s a bit of a Chuck Bass type — has an iconic father who’s impossible to please, so he parties and always has ladies on his arm. But one scene in particular just got me. He and Leighton Meester are like this super-tv-acting-power couple. Nice work, kidlets. 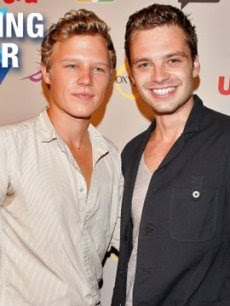 (And there’s another cute dude on Kings, the blond one there with Sebastian. fyi.) I shall keep watching it!